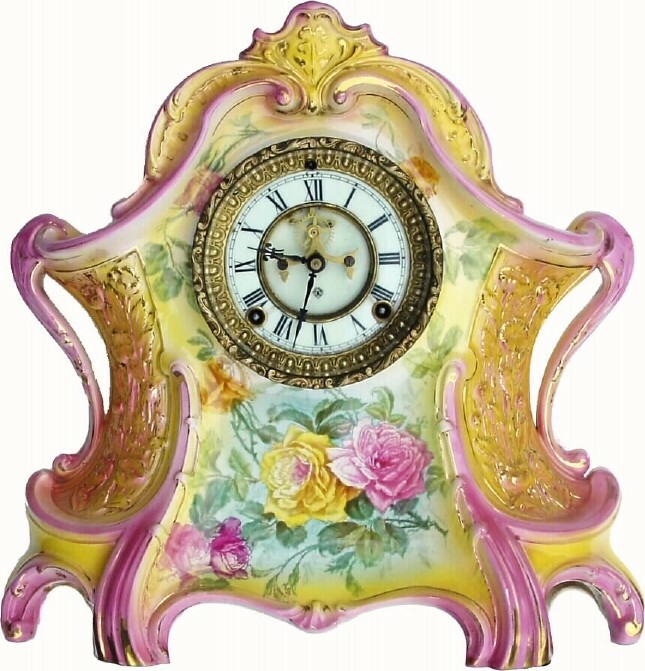 C.1910, Ansonia, La Layon, Royal Bonn, porcelain china clock in very good original condition. This is an attractive two-tone, pink and yellow case with rose decorations and good trademark on the rear. The only thing that keeps this from being excellent is a chip by the right winding hole that was filled in long ago and does not match well (really only noticeable up close). Retains original rear cover, pendulum, hands, etc. Although it is running, it would benefit from service before prolonged use. All of these Bonns have been setting price records on internet auctions. Height 14 1/2"